Au Bonheur du Jour, expert & upholstery master craftsman and decorator will carry out all your interior decoration projects and renovate old seating. Ethics that guide us: that our customers appreciate the quality and comfort of old furniture and seats whilst respecting their history. Families that have purchased or inherited quality furniture and seating appreciate our work. By carefully listening to their requirements, we take into account their wishes and take all steps to respect and enhance such assets. 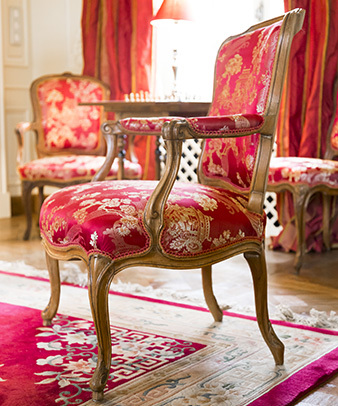 Upholsterer and interior decorator fully respecting French tradition and know-how of furniture craftsmen. Early on, Mr Slimane was lucky to carry out his apprenticeship with craftsmen from the Faubourg St Antoine whose world-class capabilities have been long time recognized. This district has been, since the 15th century, the historical centre for furniture and more specifically chair makers, upholsterers, wood carvers, gold gilders, varnishers and veneer (marquetry) specialist workers that helped to spread French taste throughout Europe and, to a certain extent, the world. This apprenticeship was the catalyst that showed him and developed a passion which led him to become Master Craftsman upholsterer. For more than 30 years, numerous prestigious customers have saluted Mr Slimanes great experience and have appreciated his capability to take on technical challenges concerning complex renovations or restorations. Whether you have a manor, a castle, a national heritage classified property, his work as upholsterer has allowed more than 2000 customers to appreciate the enhancement within their property with quality furniture, sold or renovated, respecting the original seating and using the finest fabrics. Today, Mr Slimane is established in Le Mans. With the closest of the Loire valley castles (Le Lude) only 25 miles away and just 130 miles from Paris and the Versailles Chateau, Le Mans is world renowned for its 24 hour motor racing but also its medieval city that is the surrounding for many film productions. To establish quotes and even to renovate your assets, we will travel wherever your project is located. Our furniture know-how and more specifically our ‘seating’ experience will help direct your choices in terms of armchair filling (antic or contemporary). This filling is conceived differently depending on style, shape and the age of the armchair especially if this seat is ‘stamped’ (this stamping by its original manufacturer exists since the 17th century and ensures the authenticity of the seat or furniture). Aesthetics are also to be taken into account, since, beyond their historical value, sentimental value and seating function, these seats must also embellish your interior decoration. Our experience in terms of soft furnishings will be essential to help you select your own, unique, according to the type of surrounding ensuring a truly bespoke furnishing in your home.